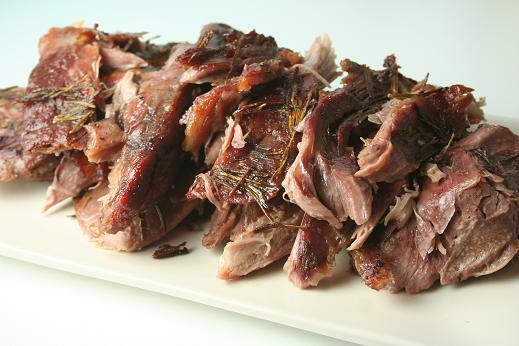 We have cooked slow roast shoulder of lamb a couple of times in the past and it always looms large in our memories as one of the tastiest meals that we can remember, especially considering that it’s so easy to prepare. Kerri’s family came to visit today and so we gladly took the opportunity to cook this again. The recipe that we’ve followed is this one, which is based on a recipe from Jamie Oliver. There are not many ingredients and it is simple to prepare, which makes the utter deliciousness all the more brilliant. The lamb cooks for a long time and becomes very tender, falling away from the bone so much that the bones come out completely clean when you remove the meat from them. The recipe specifies a sauce made from the roasted garlic, with chicken stock, capers, mint and red wine vinegar. We’ve loved this in the past and although it might not sound like it, it does go with food in the same way that a normal gravy would. It just has fresher notes due to the mint and a slight complex bitterness from the capers. Delicious. This time we made it with half the capers and mint that the recipe specified and it was still very good. We served this with both mashed potato and roast potatoes because different people wanted different types. Also green beans, kale and swede. The sauce magically goes with everything. * First, preheat your oven as high as it will go. * Using a sharp knife, score the fat layer of the lamb at about 1″ (2.5cm) intervals, then do it in the opposite direction to form a diamond pattern. I did this a bit too eagerly, making the intervals too small and cutting through the fat into the meat, but it didn’t matter. * Pour some olive oil over your lamb, rub it in with your hands and then sprinkle liberally with salt and ground black pepper, rubbing the seasoning in well with your hands too. * Pour a little olive oil into a lidded casserole dish and lay half of the rosemary sprigs into it, then scatter half of the garlic gloves amongst the rosemary springs. 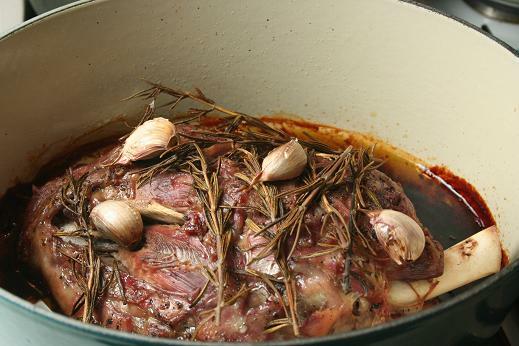 * Place the lamb into the casserole, on top of the rosemary and garlic and scatter the rest of the rosemary and garlic cloves on top of the lamb. * Put the lid onto the casserole and put it into the oven on the middle shelf of your pre-heated oven before turning down to 170°C (325°F), or 160°C for a fan-assisted oven. * Cook for four hours at this temperature. It does not need much attention, it will quite happily cook away to a deliciously soft state. * Remove the lamb from the casserole; cover it with foil and leave to rest for a while. 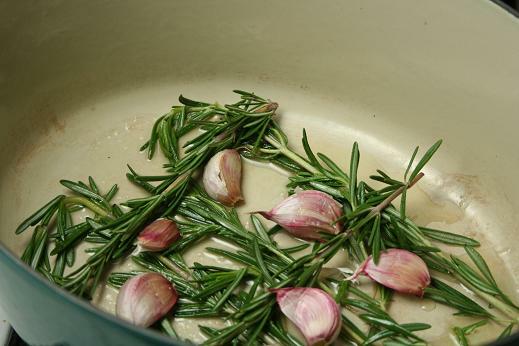 * Remove and discard any sprigs of rosemary in the casserole. Don’t worry about the little leaves that have fallen off the sprigs. Remove the roasted garlic cloves to a plate and let them cool a little. * Remove all but one tablespoon of oil from the pan. 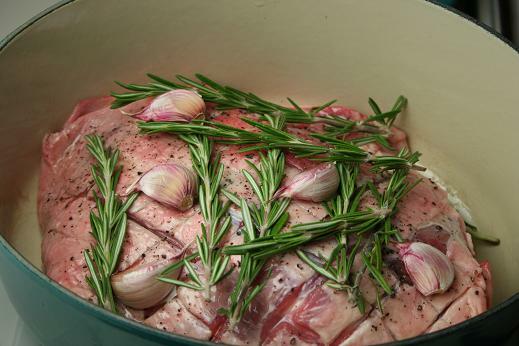 We find that a LOT of oil cooks out of the lamb, and it has a strangely green hue from the rosemary. Try to remove only the oil; retain and other juices that have cooked out of the lamb. * Take some of the roasted garlic cloves and squeeze out the soft, nutty, garlicky insides, mash them up with a spoon and put them back into the casserole. * Place the casserole on the hob over a medium heat and stir in 1 tablespoon of flour, then stirring constantly with a wooden spoon, gradually add the chicken stock. Boil, stirring, for about 5 minutes. * Add the finely chopped mint, capers and red wine vinegar, stirring it all in. * Boil gently for a few minutes, then pour into a jug for serving. * To serve the lamb, simply pull it away from the bone with a knife and fork or two forks. It should break up very easily. * Serve the lamb with potatoes, some green vegetables and plenty of the sauce. Delicious. 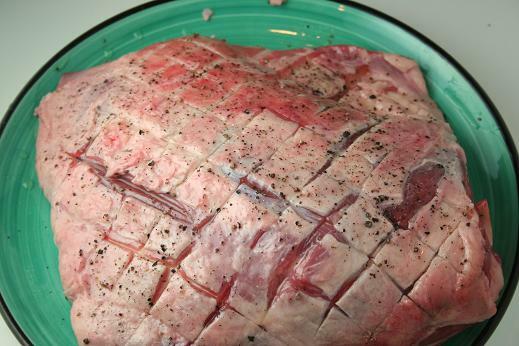 Subscribe to comments with RSS	or TrackBack to 'Slow Roast Shoulder of Lamb'. hi, do you think this method will work with a leg of lamb? It will probably work with a leg but the result will be different. The shoulder has more fat in it than the leg and that fat slowly cooks away during the long cooking process and results in very soft meat that falls away from the bone. Using a leg would could out a bit drier, but would still be tasty I’m sure. Good luck if you try it! There are lots of recipes around that use a leg. I thought we had done it this way actually but I can’t find any reference to it. Made this slow cooked lamb last night. Absolutely delicious. Great recipe. Dead easy and great results. Just made this tonight and its delicious. My family devoured it and we have decided that this recipe will be a regular for us. Love it. Thank you.